"We must preserve the past, be aware of the present and have an eye to the future." Brian Redhead, broadcaster, speaking at the Weavers' Triangle in 1991. The Weavers' Triangle Trust, which looks after the Visitor Centre, is a registered charity. 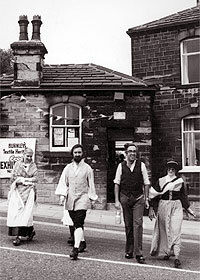 It started life in 1977 as the Burnley Industrial Museum Action Committee to work for the preservation of the town's heritage. We named an area along the banks of the Leeds and Liverpool Canal the Weavers' Triangle and began to work for its conservation, eventually changing our name to the Friends of the Weavers' Triangle. In 1980 we opened the canal toll office at Burnley Wharf as a heritage centre. In the late 1980s, the museum expanded when we were granted occupancy of the adjacent canal agent's house by British Waterways. In 1993, the Weavers' Triangle Trust was incorporated as a company limited by guarantee, with the Friends of the Weavers' Triangle continuing as a support organisation. At the same time, we took over the engine house and chimney at nearby Oak Mount Mill. Over the years the centre has won many local and national awards and in 1986 was honoured by a visit by the Prince of Wales who commented, "I hope we can do great things with the Weavers' Triangle. It is an area of great potential." In 2010 the Visitor Centre celebrated its 30th Anniversary.